I have been waiting seven and a half years for this. I spent all of last year wondering if they were ready and deciding to wait. Then they went to a birthday party and their curiosity was piqued. So, I decided it was time and crossed my fingers they were ready. The girls and I started reading Harry Potter together. In 2004, I was interning at a newspaper in Florida and completely bored one weekend. I was milling about Target and found myself in the book section. I flipped through several before begrudgingly picking up The Sorcerer’s Stone. I think I finished it before the day was over. I went back to Target and grabbed Chamber of Secrets. I was instantly in love with the magic of the, well, magical world. I have read the series three times, seen the movies too many times to remember and once dressed as Ginny Weasley for Halloween. And now, I get to relive all of the magic and mystery with my sweet girls. I spend about 15-30 minutes each night reading as much as I can in between all the questions and theories. And the best part? 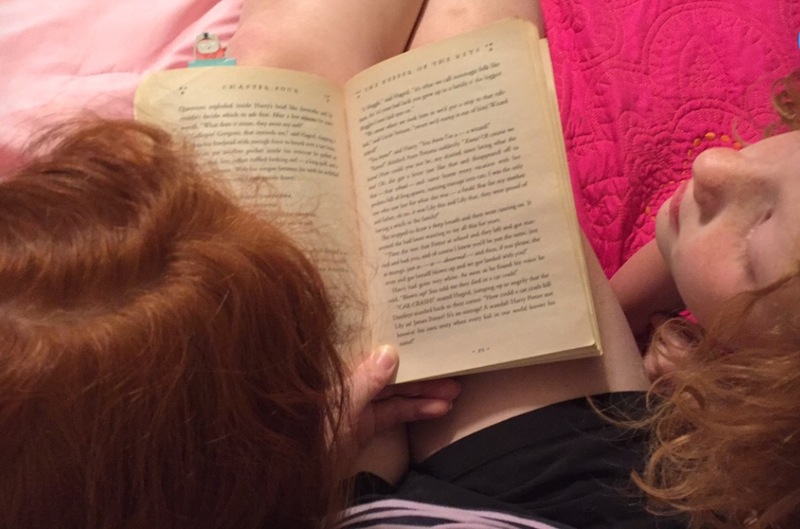 In addition to being wrapped up in a story that I have so much love for, we are also soaking up some seriously needed Mom-daughter time each night.